← Are Playback Apps Good or Bad for Birding? If you are an Arizona grandparent with grandkids graduating in Virginia and Connecticut in the summer, you go. If you are a birder, you take your binoculars. We just returned from such a trip, visiting family, celebrating graduations and touring the nation’s capital. It always amazes me to see the diversity of birdlife in different parts of the country. You don’t have to travel to Mexico, Africa or Australia to find strange birds. If your travels take you out of state this summer and you’re a birder, don’t forget your binoculars. 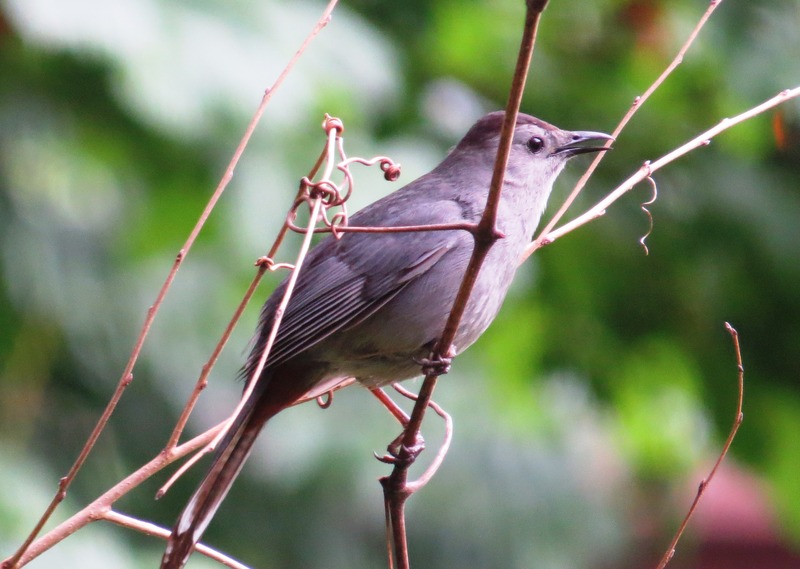 Of course, we missed some ‘yard’ birds you don’t find back east, like Verdins, Cactus Wrens and Vermilion Flycatchers. Some others are found both places, like mockingbirds and cardinals, although you might have trouble recognizing an eastern cardinal’s song. Maybe it’s that New York accent. The real treat, though, are the birds you just don’t see in Arizona, like Carolina Chickadees, Gray Catbirds and a plethora of colorful spring warblers, like Black-throated Green, Black-throated Blue, Bay-breasted, Chestnut-sided and Magnolia. Occasionally, one of these will wander or be blown off-course into Arizona, like a Magnolia Warbler that was reported at the Desert Botanical Garden in Phoenix in May. This is a stunningly beautiful bird, but I don’t think I would drive to Phoenix and elbow my way through a crowd for a glimpse, at least not when a graduating grandkid on the east coast gave me an opportunity to see dozens. Our two graduations were separated by a couple of weeks, just enough time to visit Acadia National Park and attend the Down East Birding Festival. Not sure why it’s called ‘down’ east, since this part of Maine is so far up east, an accidental turn put us in Canada. Campobello Island, Acadia National Park and Bar Harbor are remarkably beautiful and worth a visit, regardless of graduations. Bar Harbor, by the way, is pronounced ‘Bah Hahbah’, maybe another reason eastern cardinals get confused. The Down East Birding Festival is a low-key, under-attended gathering that is a fun way to add a lot of birds to your western-based life list. One of the highlight field trips they offer is a boat ride out to Machias Seal Island, under protection of the Canadian Coast Guard. With proper weather and a little luck, you get permission to land and spend an hour in an enclosed blind on this small rocky islet. 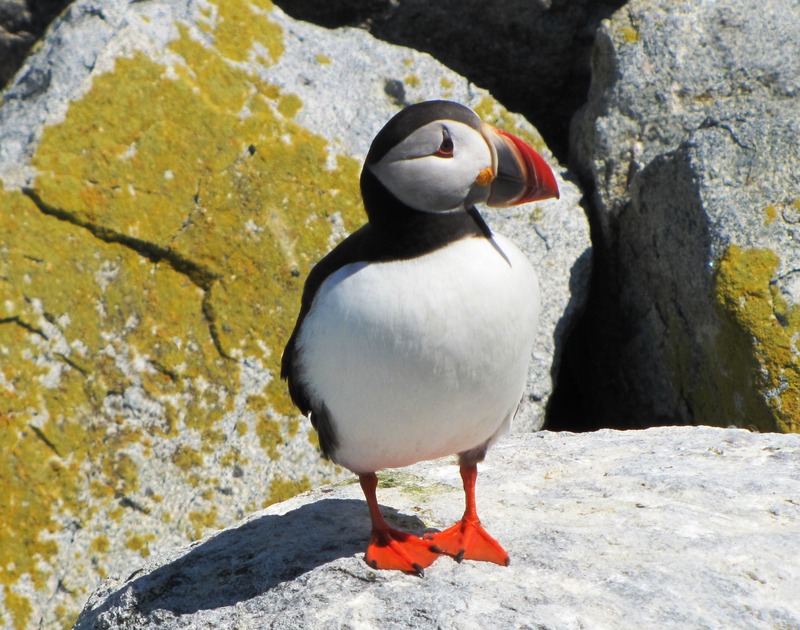 Atlantic Puffins, Arctic Terns and Razorbills nest here, and they pose so close to the blind you don’t need binoculars or telephoto lenses. The Down East Festival also provides professionally guided field trips into Moosehorn National Wildlife Refuge, a mixed woodland and wetland habitat with thick stands of spruce. Loop roads cross some of the 8,000 acres of the Edmund’s division, an area managed specifically for the American Woodcock. 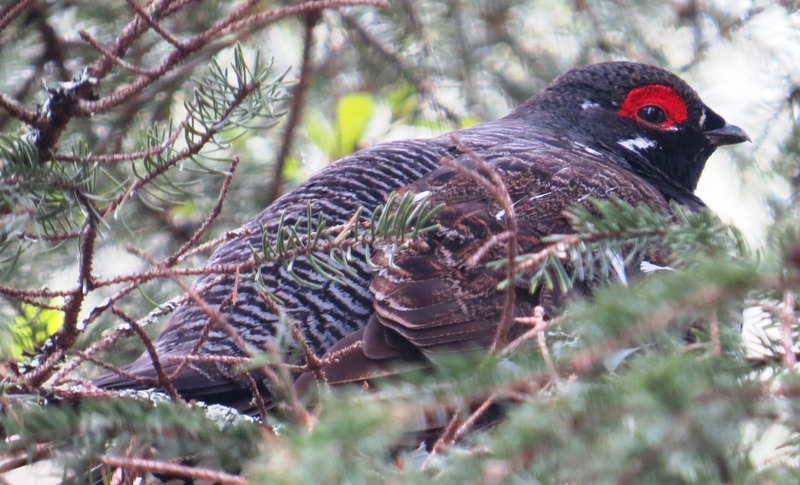 In addition to woodcocks and lots of warblers, this is a great place to find Spruce Grouse, Boreal Chickadees, Whip-poor-wills and Blue-headed Vireos. I used to wonder why warblers, vireos and Ruby-throated Hummingbirds would leave their bug-rich Mexican habitat to fly hundreds of miles north to nest in the spring. Now I know. I’ve been to bug-rich Mexico, but it doesn’t hold a candle to bug-richer Maine, home of the black fly. Black flies might be worse than mosquitoes, which, by the way, are also present. At least the males, which appear first, don’t bite like the females, but when you are picking hundreds of tiny black flies out of your facial orifices, it doesn’t seem to matter much. 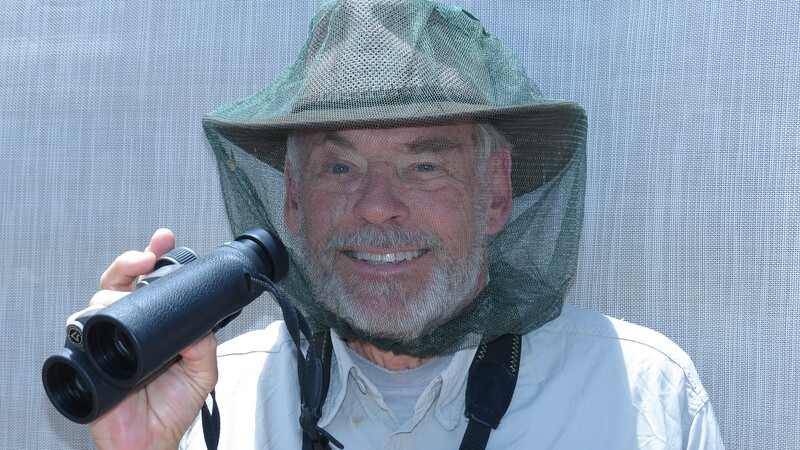 Fortunately, you can buy a bug net to cover your face and head, and, surprisingly, you can even use your binoculars while wearing it. 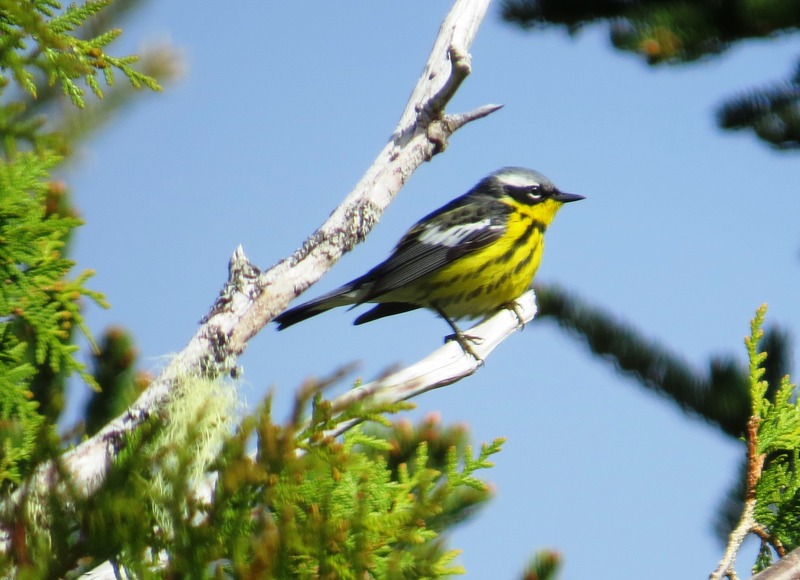 It’s worth it to get a good look at a Magnolia Warbler. This entry was posted in Uncategorized and tagged birding Maine, birding Virginia, Down East Birding Festival, Magnolia Warbler. Bookmark the permalink.